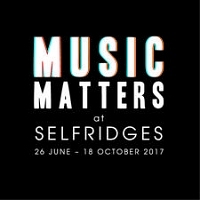 With 40% of London?s music venues closing over the last 10 years, Music Matters at Selfridges reasserts the importance of collective experiences in sound. Central to this is the Ultralounge: an intimate, state-of-the-art venue at Selfridges Oxford Street, London which will host a series of captivating performances by both established and upcoming artists. 20% of ticket profits will go to the Music Venues Trust to help its work in supporting grassroots music venues."